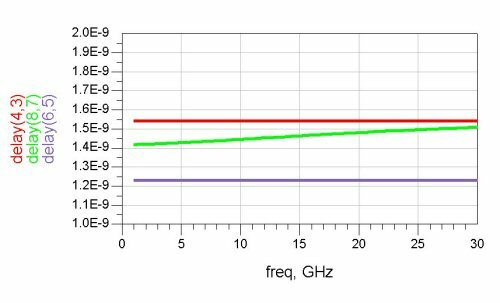 Click here for discussion of low frequency dispersion in TEM lines. Frequency dispersion refers to the property of microwave transmission lines that have different group velocity versus frequency. This is true for non-TEM transmission lines such as waveguide and microstrip. For wideband signals, you may have to worry about the effects of dispersion distorting your signal, for example, when you are trying to put a one nanosecond pulse through a waveguide near the lower cutoff frequency, you could be in a heap of trouble. Note that dispersion affects transmission line impedance as well as group velocity. In quasi-TEM media such as microstrip, dispersion is a well-known phenomenon. The dispersion of microstrip is just a few percent over a moderate frequency band, and can often be ignored. What's TEM mean? Transverse electromagnetic! Coax and stripline are TEM media. The exact conditions that are needed for TEM appear on this page. If you have a two-conductor system with a uniform dielectric material everywhere, you probable are supporting TEM. This rules out waveguide and microstrip. Below is a plot generated using Agilent ADS of the group delay of three fifty-ohm transmission lines, each one foot long, realized on Rogers 5880 Duroid (Er=2.3). The purple line (delay(6,5)) is coplanar-waveguide, the green line (delay (8,7)) is microstrip, and the red line (delay(4,3)) is stripline. Note that the stripline provides a constant group delay of 1.54 nanoseconds across frequency, which is very close to the one nanosecond per foot rule, multiplied by the square-root of the dielectric constant. See that the CPW transmission line is also quite constant group delay, but it's value is approximately 1.22 nanoseconds. This is because the effective dielectric constant of CPW is roughly equal to (1+ER)/2, or the average of free space and the substrate dielectric constant, or 1.65 in this case. Neither CPW or stripline is suffers from dispersion. Now check out the slope on the microstrip group delay... this is what we are talking about when we say frequency dispersion. Why does this matter? Distributed elements formed on microstrip will have less bandwidth than comparable elements formed in stripline. Microstrip is an industry standard for microwave circuits, because it is easy to fabricate. But it is not as good a solution compared to stripline. Dispersion in microstrip is problem that has received enormous study since microstrip was invented by ITT back in the 1950s. This explanation of microstrip dispersion will involve no math, if you are interested in the topic get a copy of Practical Microstrip Design and Applications by Gunter Kompa. The so-called "quasi-static" solution of microstrip Keff is done at zero frequency (DC), and Keff is greatly reduced from the ER of the substrate (for example, on GaAs with ER 12.9, Keff at DC might be around 8. But at infinite frequency, (think gamma rays instead of microwaves) all of the E-fields will be in the substrate, and Keff will be 12.9. Note that infinite frequency is not possible, spurious modes will propagate well before the substrate becomes even a quarter-wavelength tall (at which point it won't work at all). As more field lines enter the substrate at higher frequency, the wave slows down (more group delay), and the characteristic impedance goes up slightly. But you will never come close to Keff=ER in practical applications. Note that our microstrip calculator does not solve the frequency-dependent properties of microstrip. One of these days, Alice, we'll try to get that done! Another problem with microstrip that goes hand-in-hand with dispersion (and causes even more troubles) is that the group velocity of the even and odd modes is different. This is what causes filter skirts to be different above and below the passband of a bandpass filter. Don't confuse the two problems, Grasshopper. Now let's look at the dispersion of waveguide. 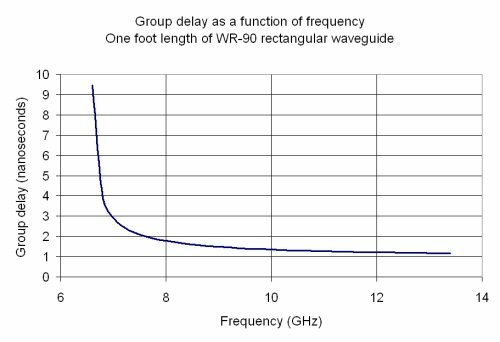 Below is a plot of the group delay for a 12 inch piece of WR-90 waveguide. It is much more dispersive than even microstrip, especially near the lower cutoff frequency. Two things to remember about dispersion: for small bandwidths, it is usually not a problem. And the longer your dispersive transmission lines (waveguide or microstrip), the worse the problem gets! Multi-dielectric coax will also suffer from dispersion. We have a page on the topic here. This is one of those problems that should be investigated using 3D EM analysis. And yes, we have already been there and done that!